Black Diamond Positron Quickpack. The Positron Quickpack features six versatile Positron quickdraws for multi-discipline functionality. 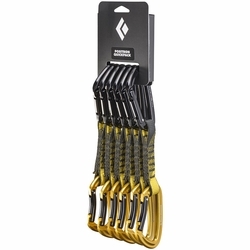 The Black Diamond Positron Quickpack gives you six of BD's light, versatile Positron quickdraws that are ideal for any climbing application. Whether you're clipping bolts at the crag or extending placements in the alpine, these quickdraws provide full keylock functionality for hassle-free clipping and cleaning.